One of the best, yet relatively unknown features, of Mac OSX is the ease with which you can share a connection. 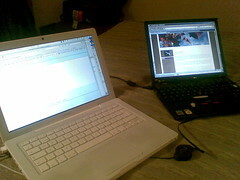 I tried with my work computer - the Thinkpad on the right - to get to the internet, but alas, no such luck. The WLAN connection does not work (signal is too weak) and for some reason, it also refuses to discover my cell phone over Bluetooth (it does, however, discover my previous phone, which is 2900 km away - some radio, huh?) However, my Mac does work (the Macbook antennas are apparently very good), so for once I'm grateful that I happened to lug two laptops with me. I just wanna comment something here about roaming costs.. I flew to Zürich. I used jmirc on my phone when i was waiting my continuing flight at Berlin. When i arrived to Switzerland, i also used irc in train. The dataconnection was established for one hour and 30 minutes. Transferred data was something like 37 kt. Yup. A single Outlook sync will cost you or your company 30 euros or more almost anywhere. And then you have these spots where the cost just goes through the roof! "Main_blogentry_250407_1" last changed on 25-Apr-2007 22:42:29 EEST by JanneJalkanen.